[LASD 2014] — Sheriff Baca commands the largest Sheriff's Department in the United States with a budget of $2.4 billion. He leads nearly 18,000 budgeted sworn and professional staff. The Sheriff's Department is the law enforcement services provider to 42 incorporated cities, 130 unincorporated communities, 10 community colleges, and over one million daily commuters of the Metropolitan Transportation Authority and Metrolink. Over 4 million people are directly protected by the Sheriff's Department. The Sheriff's Department also protects 42 Superior Courts and 600 bench officers. Moreover, the Department manages the nation's largest local jail system with a housing capacity of nearly 20,000 prisoners. Sheriff Baca is the Director of Homeland Security-Mutual Aid for California Region I, which includes the County of Orange. Region I serves 13 million people. Sheriff Baca incorporates innovative best practices into his leadership style based on pro-active, progressive problem solving. His development of leadership qualities in all levels of the Sheriff's Department have resulted in strong solutions to problems such as drug addiction, domestic violence, homelessness, gangs, illiteracy, at-risk youth, parenting, and the quality of life in neighborhoods. He also manages eighteen non-profit Youth Athletic League Centers serving at-risk youth in after-school programs involving academics, sports, and cultural arts. Sheriff Baca also developed the Office of Independent Review, comprised of six civil rights attorneys who provide independent oversight on all internal affairs and internal criminal investigations concerning alleged misconduct by Department personnel. This unique model of civilian oversight is a natural model of police accountability. Sheriff Baca earned his Doctorate of Public Administration Degree from the University of Southern California. He is a life member of the Honor Society of Phi Kappa Phi, USC Chapter. A strong advocate of education, he developed the LASD University consortium with over 20 universities where over 1,000 members of the Sheriff's Department are enrolled in Bachelor's and Master's Degree programs. 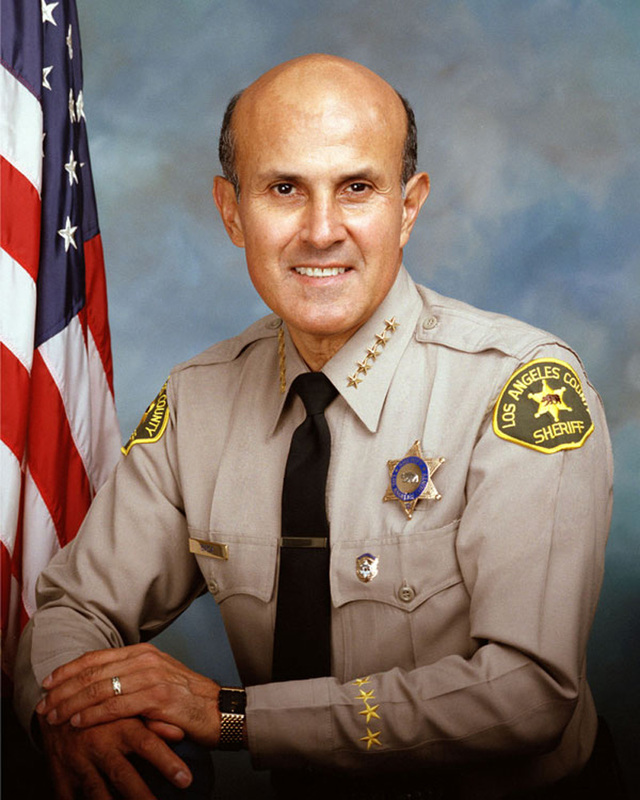 Sheriff Baca was elected Sheriff of Los Angeles County in December 1998, and was re-elected in 2010 for his fourth term in office. He entered the Sheriff's Department on August 23, 1965. He served in the United States Marine Corps Reserves. UPDATE: On May 12, 2017, Baca was sentenced to 3 years in federal prison for obstructing an FBI investigation of inmate abuse. SD1401: 19200 dpi jpeg from smaller jpeg.